Let’s be realistic. This has been an unsuccessful season for the declining singing talent show, American Idol. After 12 seasons it seems that the show is losing touch with the viewership and the loss of ratings evidences this theory. The show is formulaic, almost intransigent in its weekly routine. Superficially, there have been some changes to how the results are revealed, for example, but these are not extensive. It seems like I am a bit captious in this brief synopsis, but after so many years of watching the show I’d love to see American Idol transform with the times. The basic structure will always be effective and enjoyable, but the show needs to do a massive re-haul of the judges (which seems to be happening) and the creative content. For the most part, Season 12 of American Idol came down to two singers. Putting aside the sycophantic, effusive praise machines that were the four judges this year and the top 10 that was almost completely devoid of talent, the show was saved by two vocal powerhouses – one a gritty country vocalist and the other an Aretha Franklin-like, soul superstar. Back on March 11 when I made my predictions for the Idol Top 10, I went on the logic that these two singers would be in it until the end, and I am happy to report that I was accurate in my guess. 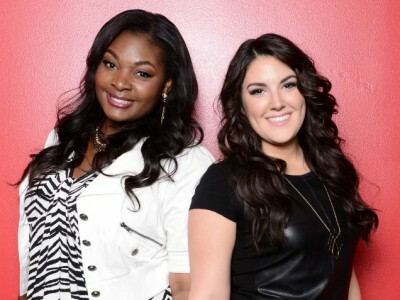 Kree Harrison and Candice Glover make up your final two. Of all of my predictions, I was most wrong about Amber Holcomb. I initially viewed her as a throw-away contestant who would be the first eliminated in the Top 10, but she made it all the way to 4th place. This was more of a testament to the lack of talent among the top 10 than her own ability. For some reason the judges gushingly extolled her like she was the second coming of Beyonce. Holcomb’s voice only worked in the lower register, and when she tried pushing it higher she was invariably flat. Yet despite her clear inability, the judges praised her with impunity. It was strange. Sometimes it felt like the judges were listening to another artist. Back to Kree and Candice. Who will win? In my initial predictions I chose Kree. The country audience is just so strong. Now, I’m not sure. Candice has proven that her voice is freakishly good. She is a vocal spectacle. It is an absolute wonder to listen to her sing. In March I compared her with Jennifer Hudson and said her “big voice should help her sail through the competition.” It may help her win it. Check out her performance of “Somewhere.” Just mind-blowing. Kree “has rangy chops and her voice just fits today’s country music scene.” I agree with my assessment from March. She has displayed her relevance and ability. It would not surprise me if she made good on my March prediction and won Season 12. Ultimately, though, I will be happy with whoever wins, and it will be good to see “American Idol” have its first female winner since Season 6 and first all-female final since Season 3 when Fantasia won. The top 3 were pretty easy to pick. At the end though, I was thinking Angie would have been a better pick than Kree. Kree levelled off and went safe on us whereas Angie turned it up a few notches to the point I actually saw her as a potential artist. Either way, Candice should be the winner. Great talent. Yeah. The country vote carried Kree. Ultimately, as you wrote, Candice should be the winner. She has the strongest voice.